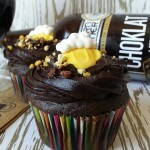 There are a million stout cupcake recipes on the internet. Why add another? Because all of those recipes assume you have time. Which many of you do not. This cupcake recipe is a shortcut. It uses cake mix and canned frosting. But don’t you dare poo-poo it. It was recently a mega-hit at a March for Dimes charity bake sale and everyone is consistently shocked when they find out it was made from a mix. What makes it special? Two simple things. A solid chocolate stout (like Southern Tier’s Choklat) and an extra egg. That’s it. You’ll blow people away with this moist and fluffy cake recipe. Whether or not you admit it’s from a box mix, is up to you. Blend together mix, oil, eggs and beer. Fill cupcake liners 2/3rds the way full. 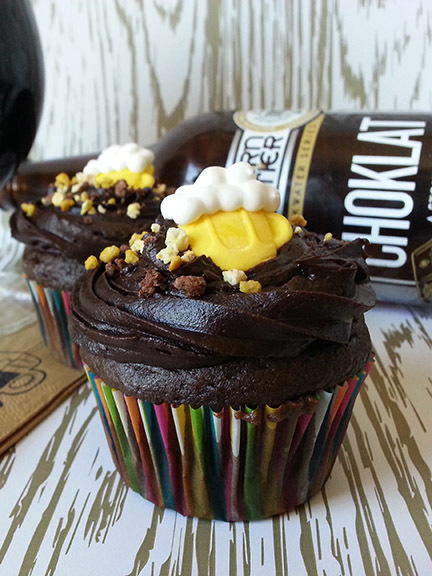 Who says you need to slave away in the kitchen to make delicious craft beer treats? Bake. About 20 minutes. Until a toothpick comes out clean. Let cool. Frost and decorate. Devour. Note: If you get another brand cake mix, just follow the instructions on the back, except add an extra egg and replace your water with beer. Simple as that. Enjoy!